Seven Things You Should Know About Going Gluten-Free. And Why Going Gluten-free Really Should Be Going Paleo. – Going Gluten-Free. Seven Things You Should Know About Going Gluten-Free. And Why Going Gluten-free Really Should Be Going Paleo. Are you new to gluten-free? Or have you been gluten-free for a while but still aren’t feeling a hundred percent? Here are seven things you need to know about going gluten-free, that you might not have considered yet. 1) You don’t have to be diagnosed with Celiac Disease (CD) to have a problem with gluten. 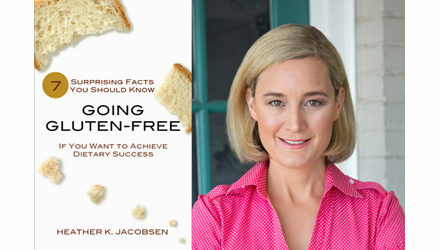 While CD accounts for less than 1% of the world’s population, Non-Celiac Gluten Sensitivity (NCGS or GS) may account for 8 to 15% of the world’s population (or even much higher), and experts in the field take it just as seriously as CD. Celiac Disease is just the “tip of the iceberg” of gluten-related disorders. Also, the effects of gluten are not always felt in the digestive tract. Arthritis, skin diseases and neurological disorders are just some of the extra-intestinal complaints that have shown links to gluten. In fact, gluten ataxia, a very serious brain disorder caused by gluten has been shown to often have no digestive symptoms at all. So, if you’re feeling ill and you think its gluten, don’t worry about whether or not your doctor can produce a positive diagnosis of Celiac Disease. You can (and should) wait to start your gluten-free diet until after any biopsies and blood tests are taken. But if you’ve had all your tests, and still think its gluten, you have nothing to lose by eliminating it from your diet. You can also take this self-diagnostic test to see if any of the symptoms sound familiar to you. 3) You cannot trust gluten-free labeled food products or gluten-free menu items at restaurants to be one hundred percent safe. Because our “gluten-free” grains are contaminated, and because some amount of gluten is still allowed in foods labeled gluten-free, it’s best to eliminate processed foods altogether. Plus, look at all the other suspect ingredients in your packaged foods. Can we really trust that they are “good” for us, after all our bodies have been through. For the same reasons, you need to take precautions when eating out at restaurants. Your experience at a restaurant with gluten-free options depends on the knowledge and experience of the waiter, the chef, the food prep handler, and the manager. That’s a long chain of people to put your trust into. It is possible to eat out safely if you find the right establishment, but the restaurant staff needs to be knowledgeable in everything from cross-contamination (such as not cooking French fries in a fryer shared with breaded foods) to all the different ingredient-names the gluten can fall under. 4) Seventy-five percent of adults have a decreased ability to digest lactose, and even if you’re of Northern European or New Zealand descent (among the few ethnic groups known to tolerate lactose into adulthood), if you have celiac disease, consuming milk may still be a problem. In fact, fifty percent of people who have celiac disease also have reactions to cow’s milk proteins. This may be because gluten proteins may find their way into cow’s milk, since it does happen in human mother’s milk. Also people may cross-react to dairy, which is when proteins resembling gluten confuses your body into thinking it is actually gluten. Whether it’s the milk sugar, the milk protein or because of cross-reactivity, either way, if you truly want to begin your healing process, you should also eliminate dairy. At least for the first month or so. You can always experiment with bringing (quality) dairy back into your diet later. 5) Gluten causes “leaky gut,” also known as intestinal permeability. This in turn leads to a variety of very serious health concerns. One side effect of intestinal permeability is an increased sensitivity to many more foods besides just gluten. Therefore, it’s important to pay attention to other foods that may be causing you issues, and avoid them until your gut has healed. Genetically modified corn and soy also cause leaky gut. And most corn (a grain) and soy in the US are genetically modified. Therefore, I recommend sticking to organic (which also means non-GMO). 6) Plus, soy has its own set of problems, including causing hormonal imbalances that can disrupt thyroid production and/or reproductive processes, and much more. So, I believe you should eliminate soy from your diet, and while we’re at it, eliminate all legumes, as well. Many of them can cause discomfort from gas and bloating, which you don’t need right now. And some actually contain toxic lectins and phytates (unless prepared properly) that are harmful to an already compromised gut. Once your gut begins to heal, it may be possible to bring some of the more gentler legumes back into your diet, but soy should still always be avoided. 7) Wheat contains opioids, making you physically addicted to gluten. Yes, opioids, as in the same type of peptides found in morphine, cocaine and heroin! Its already hard enough that you have nostalgic and emotional attachments to your favorite gluten-containing foods. In addition, sugar, grains and empty carbs also keep you in an addictive blood sugar rise-and-fall cycle that makes it hard for you to not to give in to crazy cravings. Therefore, you need to break your multi-faceted addiction to gluten and the best way to do that is to eliminate sugars and excess carbs from your diet. A side benefit is that you may actually lose weight (and in some cases, if you’ve been under-nourished, you may gain your weight back)! I know what you’re thinking right about now: is there anything left to eat after you’ve gone gluten-free, grain-free, dairy-free, GMO-free, soy-free, legume-free, low-carb, sugar-free, non-processed and organic? You betcha! I know it seems like a lot to take in, especially if you’re new to gluten-free altogether. But for these reasons, I believe the only way to truly heal after gluten has caused you disease, is to go on a paleo diet, which mimics the way Paleolithic man and hunter-gatherer societies ate before the advent of agriculture. Our modern “diseases of civilization” are rare or nonexistent among hunter-gatherers, both of the past and today, indicating that Paleolithic man had no obesity, no cardiovascular disease, no osteoporosis, no cancer, no autoimmune disease, and no tooth decay. It does make you think, doesn’t it? Eliminating so many foods may seem a little daunting in the beginning, but instead of focusing on what you can’t eat, focus on what you can: quality meats, including healthy fats, as well as fresh vegetables and some fruit (remember fruit, has sugar, too). These days there are tons of talented paleo chefs sharing their recipes and cookbooks, and there are even paleo restaurants and packaged foods popping up here and there, that can help you ease into your new healthy diet. You can also check out my own paleo recipes here to help get you started. Once you begin to regain your health, it will be all worth it. You may even be surprised to find that you no longer crave all those foods that were causing you health problems in the first place. [*] The study shows that a diet free of cereal grains that may be cross-contaminated helped celiac patients to heal. The diet did allow rice. And 18% of the patients still did not heal. Whether or not that is because of the rice, there is no way to know. But there have been other studies that show that glutenin antibodies can cross-react to rice (Braly & Hoggan, 2002), so I advocate for eliminating all grains until healing begins. Louisville Celiac Sprue Support Group, June 2003. Early Diagnosis Of Gluten Sensitivity: Before the Villi are Gone. https://www.enterolab.com/StaticPages/EarlyDiagnosis.aspx. Dietary treatment of gluten ataxia M Hadjivassiliou, G A B Davies-Jones, D S Sanders and R A Grünewald doi: 10.1136/jnnp.74.9.1221 J Neurol Neurosurg Psychiatry2003 74: 1221-1224. Intestinal Damage from Celiac Disease Persists in Adults, Even with Gluten-free Diet. National Institute of Diabetes and Digestive and Kidney Diseases. September 2011. http://celiac.nih.gov/TissueDamage.aspx. Thomson, T, Lee AR, Grace T. Gluten contamination of grains, seeds, and flours in the United States: a pilot study. J Am Diet Assoc. 2010. Jun; 110 (6): 937-40. Mattar R, de Campos Mazo DF, Carrilho FJ. Lactose intolerance: diagnosis, genetic, and clinical factors. Journal of Clinical and Experimental Gastroenterology, 202;5:113-121. E Hopman, L Dekking, D, F Beelen, N Smoltsak, S de Vries, L Dogger, L Mearin and F Koning. Presence of gluten proteins in breast milk: implications for the development of celiac disease. Chapter 2. Gluten intake and gluten-free diet in the Netherlands. Department Pediatry, Leiden University Medical Center (LUMC), Leiden University, Leiden. A. Vojdani and I. Tarash, “Cross-Reaction between Gliadin and Different Food and Tissue Antigens,” Food and Nutrition Sciences, Vol. 4 No. 1, 2013, pp. 20-32. Jacobsen, Heather. Fact #6. Soy is NOT a Health Food. Going Gluten-Free. Seven Surprising Facts You Should Know if You Want to Achieve Dietary Success. Pp. 20 – 23. 2016. Smith-Christiansen Associates. Carrera-Bastos P, Fontes-Villalba M, O’Keefe JH, Lindeberg S, Cordain L. The western diet and lifestyle and diseases of civilization. Research Reports in Clinical Cardiology. 2011 Mar; 2011 (2): 15-35. Price, W.A. Nutrition and Physical Degeneration. A Comparison of Primitive and Modern Diets and Their Effects. Paul B, Hoeber, Inc. Medical Book Department of Harper & Brothers. New York. London. 1939. 445 pp. Previous PostWhy a Gluten-Free Diet? Why not Wheat Free? What About Grain-Free? Next PostGluten Sensitivity Is NOT a Social Contagion! Here are the facts. Thank you for this powerful article! My daughter is severely gluten sensitive and I am attempting to keep our kitchen gluten-free. You brought up some points that I would have never considered. I really appreciate the warnings and the guidelines. Thank you so much for your comment, Jinni. Please let us know how else we can help!